Hi there! After a few recent nail fails I seem to have found my mani mojo again. 🙂 So today’s post is about a recent mani I really, really liked. As usual, I didn’t know what to do with my nails. So I started with two base colours – Andrea Fulerton Nail Boutique Kate (pinky, index finger) and Rimmel I ♥ Lasting Finish 080 Black Cab (ring finger, middle finger, thumb). I wanted to stamp. So I selected a few pretty images from my JQ-L04 stamping plate. 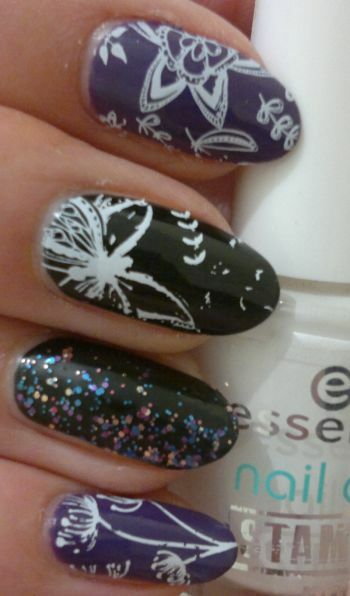 And I stamped on the images with Essence’s Nail Art Stampy Polish in white. But I also wanted some sparkle. And I opted for Barry M‘s Masquerade (gold, fuchsia and light blue glitter in a clear base). I’m very pleased with how the mani turned out. It’s got a butterfly and floral images, glitter, purple and black & white. What’s not to love? 🙂 Please feel free to let me know what you think about this mani. And thank you for stopping by! Hi there! I’ve done a lot of stamping recently, so I thought it’s time to do a glitter mani again. I chose NYC In A Minute 019 A Perfect Day (grey) and the blue polish from Andrea Fulerton’s Nail Boutique Art Attack Trio as my base colours. 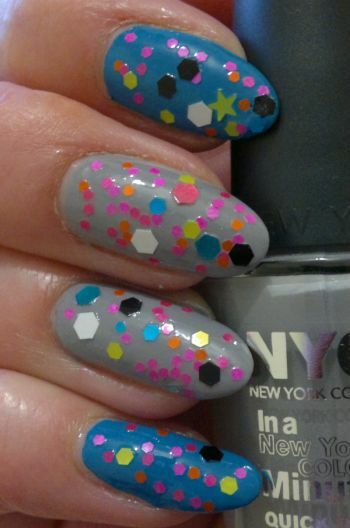 The NYC polish is fantastic in every way – but the Andrea Fulerton polish annoyed me a bit. It took ages to dry – well over 45 minutes per coat. Fortunately I was watching a movie, so my hands weren’t busy. The glitter is one of my favourite glitter mixes – it’s called Funky Town and I think it’s the ultimate rock star glitter mix. I’ve done a mani – quite similar to this one – with the same glitter mix before. If you’d like to compare the manis and tell me which one you like better, you can find the other mani here. Feel free to let me know which mani you like better – the one from last year or this one. And thanks for stopping by!